Several AIDS cohort studies observe that the incubation period between HIV infection and AIDS onset can be shorter than 3 years in about 10% seropositive individuals, or longer than 10 years in about 10–15% individuals. On the other hand, many individuals remain seronegative even after multiple exposures to HIV. These distinct outcomes have recently been correlated with some mutant genes in HIV co-receptors (e.g., CCR5, CCR2 and CXCR4). For instance, the mutant alleles Δ32 and m303 of CCR5 may provide full protection against HIV infection in homozygotes and partial protection in heterozygotes; moreover, infected heterozygotes may progress more slowly than individuals who have no mutant alleles. Frequencies of these mutant alleles are not very low in Caucasian populations, therefore their effects may not be insignificant. 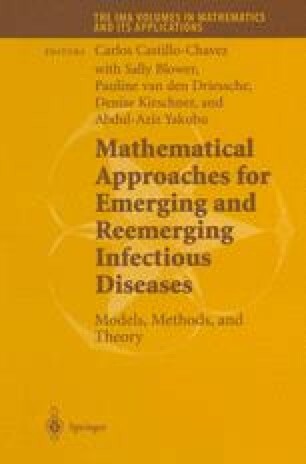 To investigate the impact of such heterogeneity on the spread of HIV, Hsu Schmitz (2000a,2000b), based on available data, proposes a specific type of models where susceptibles are classified as having no, partial or full natural resistance to HIV infection and infecteds as rapid, normal or slow progressors. She also applies the models to CCR5-Δ 32 mutation in San Francisco gay men. This manuscript sketches her models with focus on the basic model without treatment and an extended model with treatment in certain proportion of newly infected individuals. The same example of CCR5-Δ 32 in San Francisco gay men is used, but some parameters are estimated in different ways. The results are very similar to those in Hsu Schmitz (2000a,2000b) with the following two main conclusions: 1) without any intervention, HIV infection will continue to spread in this population and the epidemic is mainly driven by the normal progressors; 2) treating only a certain proportion of newly infected individuals with currently available therapies is unlikely to eradicate the disease. Additional interventions are thus necessary for disease control.